Against a backdrop of protests, Senate Democrats scrambled on Tuesday morning to stall confirmation hearings for Brett Kavanaugh's appointment to the U.S. Supreme Court with a motion to adjourn and postpone. The move encapsulated the partisan division in the Senate's bitter fight over President Donald Trump's second pick for the highest court, but ultimately the back-and-forth between Democrats and Judiciary Committee Chair Chuck Grassley (R-Iowa) only ended up in delaying opening statements by roughly an hour. Democrats have focused their opposition arguments against Kavanaugh on the Senate GOP's haste with the confirmation proceedings and their lack of access to the bulk of the judge's White House record. Late Monday night, the National Archives released 42,000 pages of additional pages from Kavanaugh's work with President George W. Bush. Democrats were quick to contrast the process with President Barack Obama's failed nomination of Merrick Garland. "I have served in the Senate 44 years," Sen. Patrick Leahy (D-Vt.) said once opening statements were underway. "I've voted on 19 nominations to the Supreme Court. I mention this because I have a sense of history. I've never seen in that 44 years so much at stake with a single seat. I've also never seen such a dangerous rush to fill it." Grassley threatened to extend the hearings through the weekend if Democrats stalled proceedings, as the Democratic committee members called for revoking executive privilege that the Trump administration has used to protect thousands of documents from public view. More than 480,000 documents in total have been submitted for review of Kavanaugh's judicial and administrative record. On Monday, Senate Judiciary Committee Democrats also sent a letter to White House Counsel Donald McGahn, whose upcoming exit Trump announced last week, asking that Trump withdraw his "constitutional privilege." Once opening statements launched, Democrats homed in on core issues starting with Roe v. Wade and gun control, noting Trump's promise to conservatives that he would appoint a "pro-life and pro-gun" judge. "We cannot find the documents that absolve from that conclusion" that Kavanaugh is such a judge, Sen. Diane Feinstein (D-Calif.) said in her opening statement. Feinstein said she feared that his nomination put "what women have won through Roe and a host of privacy cases" at stake. On abortion, Feinstein referenced Kavanaugh's opinion in the well-publicized Garza v. Hargan lawsuit; in that case an undocumented minor sued HHS after the department blocked her from obtaining an abortion while she was in its custody. That ruling sided with the minor. In his dissent, Kavanaugh acknowledged that Roe v. Wade gave her the right to an abortion but argued HHS shouldn't be required to allow an abortion and that a delay until the plaintiff found a sponsor didn't constitute "undue burden." "The argument rewrites Supreme Court precedent and if adopted would determine whether a woman had a sufficient network to make decisions," Feinstein said. Earlier Tuesday, the White House released excerpts from Kavanaugh's opening statement, in which he anticipated Democratic attempts to pin him down on potential rulings. 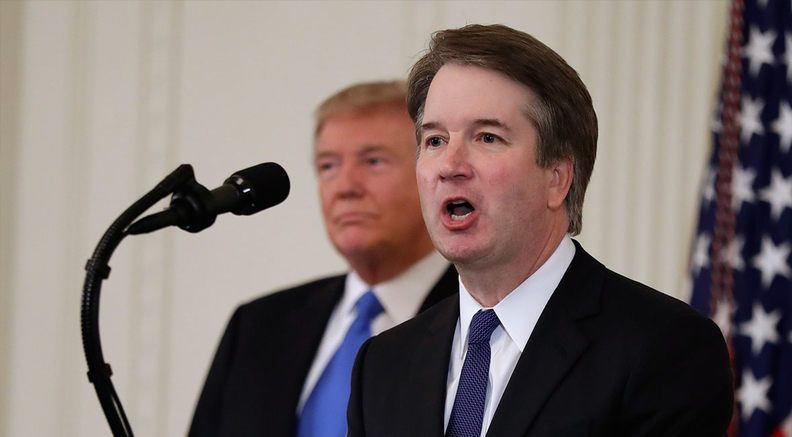 "A good judge must be an umpire—a neutral and impartial arbiter who favors no litigant or policy," Kavanaugh said. "I don't decide cases based on personal or policy preferences. I am not a pro-plaintiff or pro-defendant judge. I am not a pro-prosecution or pro-defense judge. I am a pro-law judge." Democrats also brought witnesses including the Rev. Al Sharpton and leaders from Native American tribes and civil rights organizations to testify.